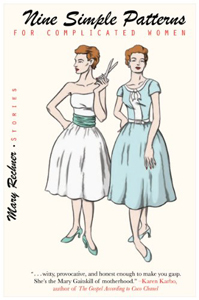 MARY RECHNER IS FROM PORTLAND, OREGON, USA. Her short story collection Nine Simple Patterns for Complicated Women, was published in 2010 by Propeller Books and was nominated for the 2011 Frank O’Connor International Short Story Award. Her story ‘The Playwright Sits Next to her Sister’, explores the relationship between two very different sisters. She’s working on a new book, a linked story collection, Living and Dying on the East Coast. Being a writer in Portland is like belonging to a large rowdy non-exclusive club. It may be old-fashioned American slang to say so, but short stories are the bomb. Life made me want to write. Life, and a fear of chaos. 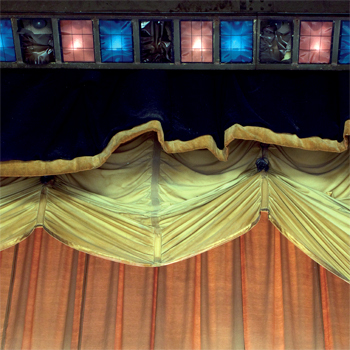 Why did you choose the photograph of the stage curtains at Hornsey Town Hall? I selected it, because one of the characters in the linked story collection Living and Dying on the East Coast is a playwright. Writing about this photograph was a great way for me to put two of my characters (sisters) in extremely close proximity – in this story they inhabit a funny public/private space. Do visuals and art inspire your writing? I love looking at art in galleries and museums; I find the work of other artists thrilling, and I’m inspired by everyone who cultivates a creative practice. Have you collaborated with visual artists in the past? 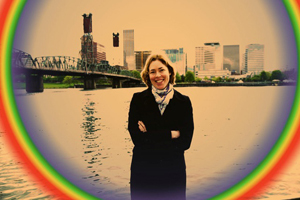 I have worked with my friend, photographer Christy Goldsby; she took this photo of me in Portland, Oregon. We really have rainbows like this!